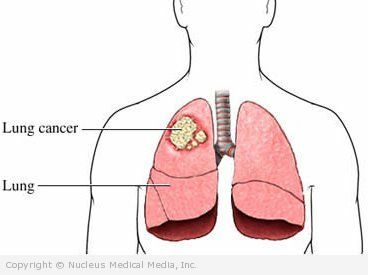 Lung cancer is a disease in which cancer cells grow in the lungs. Cancer occurs when cells in the body divide without control or order. If cells keep dividing uncontrollably, a mass of tissue forms. This is called a growth or tumor. The term cancer refers to malignant tumors. They can invade nearby tissue and spread to other parts of the body. Once lung cancer is found, staging tests are done to find out if the cancer has spread. The goal of treatment is to eliminate the cancer and/or control symptoms. Chemotherapy is the use of drugs to kill cancer cells. This may be given in many forms, including pill, injection, and via a catheter. Chemotherapy is often used to kill lung cancer cells that have spread to other parts of the body. Photodynamic therapy (PDT) — a type of laser therapy. A chemical is injected into the bloodstream. It is then absorbed by the cells of the body. The chemical rapidly leaves normal cells. It will remain in cancer cells for a longer time. A laser aimed at the cancer activates the chemical. This chemical then kills the cancer cells that have absorbed it. This treatment may also be used to reduce symptoms. If you are diagnosed with lung cancer, follow your doctor’s instructions. Do not start smoking. If you smoke, quit. Test your home for radon gases and asbestos. Have these substances removed if they are in the home. Do not work in a place with asbestos. The American Lung Association and American Cancer Society both suggest that screening for lung cancer with a type of CT scan may be considered if you are a smoker (or former smoker), aged 55-74 years, and have a history of heavy smoking (eg, one pack a day for 30 years).